● I'm looking for a next job very hard. (It's the second choice if no one employ me). ● I have no released open source software. ● I have two projects on github as fol ows. Is USB a computer network? to each device in logical. How to communicate on USB? Where is the host computer? Which devices are the host? We have an important problem. of such devices without any laptop? navigators, smartphones and so on. ● Electrical tap on the USB cable. ● Develop a USB Man in the Middle device. in theme for this presentation. It's very easy, but it has some big problems. ● The device must have two USB ports. – One is for connecting a host. – Another is for connecting a device. ● USBProxy makes 6 kinds of threads runninng. the Endpoint on the device. Input EP when it got data. ● Writer for Input EP sends data to the host. and data from the host. Output EP when it got data. 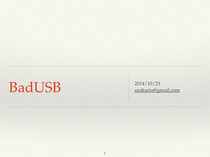 ● USBProxy does not simulate the USB line. ● It just simulates endpoints on only one device. ● We want to simulate more devices. ● In many cases, it fail to simulate a device. ● It can't handle some complex devices yet. ● Linux lose endpoints on a device sometimes. ● It can't notice reset signal from a device. – USBProxy relay speed is 1,9MB/s. Do you want to fall in darkness?